I don’t know if it’s because I watched the behind-the-scenes look at a McDonald’s Quarter Pounder photo shoot (actually pretty fun to see how they do it, especially if you’re into food styling) or what, but I’ve been hungering after a burger like mad recently! Cheese: Toma by Point Reyes Farmstead Cheese Company. (They’re the ones who make my favorite, gluten-free blue cheese that I talked about last year.) Find it at Whole Foods and Cowgirl Creamery, or ask for it at your local cheese shop. Another couple of options: Wagon Wheel by Cowgirl Creamery or Nicasio Reserve by Nicasio Valley Cheese Company. A few bites in, I was all smiles. It was just like one of those $12 restaurant burgers, but homemade. And only a fraction of a cost, even with my kinda fancy ingredient choices. And on a bun, a bun that’s actually gluten-free and a buttery, airy indulgence — so much better than an Iceberg lettuce wrap. (Can you tell I am basically in love with those buns?) And so filling that I didn’t even miss the fries — you can easily skip serving a side dish — score! Pretty much, summer is off to a scrumptious start! Cook the patties however you like or as follows: Preheat cast iron skillet(s)/griddle(s) over medium-high heat. Once hot, coat with a very thin layer of peanut oil. Arrange patties on the pans, cook for 1 – 2 minutes on the first side. Flip, top with cheese and cook for about 2 minutes more¹. Top buns with cheeseburgers, bacon, shallot, avocado, tomato and lettuce. Serve immediately. ¹ The inside will be slightly pink. Please note that consuming raw or undercooked beef may increase your risk of foodborne illness, especially if you have certain medical conditions. Aren’t Point Reyes cheeses the best? It’s my total splurge cheese for special occasions but I bet Toma was amazing on the burger. 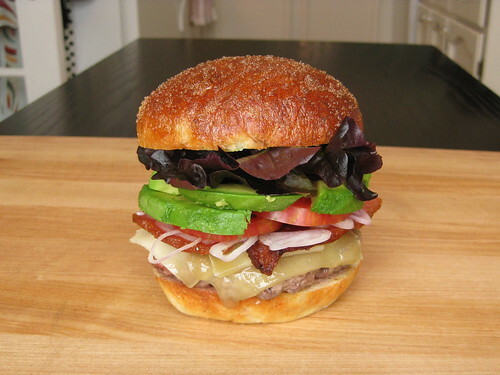 And brioche buns – nice! thanks, peggy! totally agree — always a nice challenge figuring out just how to eat it without creating a total mess :).